I did this piece in 2012 when I was 24 years old. Before I did a painting with three canvases that changed around only horizontally, any which way you put them, they would always fit like a changeable puzzle… well, with this solution there is more than 200,000 possible combinations, to be more precise by geometric placement rules of 4 square canvases would be 262,144 or without any rules there can be infinite amount of combinations, which would represent the idea that life keeps changing and can change in any given direction. 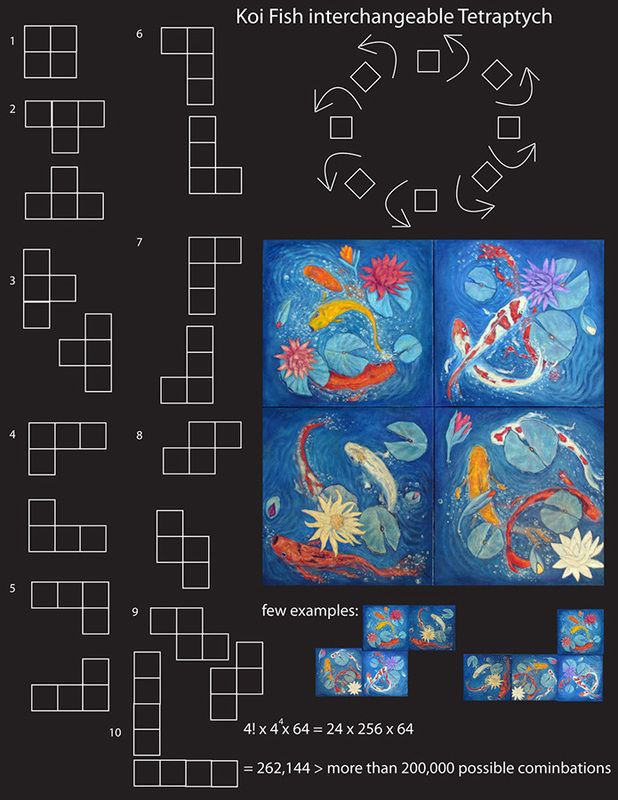 (Technically speaking you can take this idea to any extreme you want by adding more canvases, but I wanted to prove that all you need is just 4 canvases for a myriad amount of combinations.) The concept is that good and evil are one and in co-existence, and without evil there wouldn’t be good or vice versa. 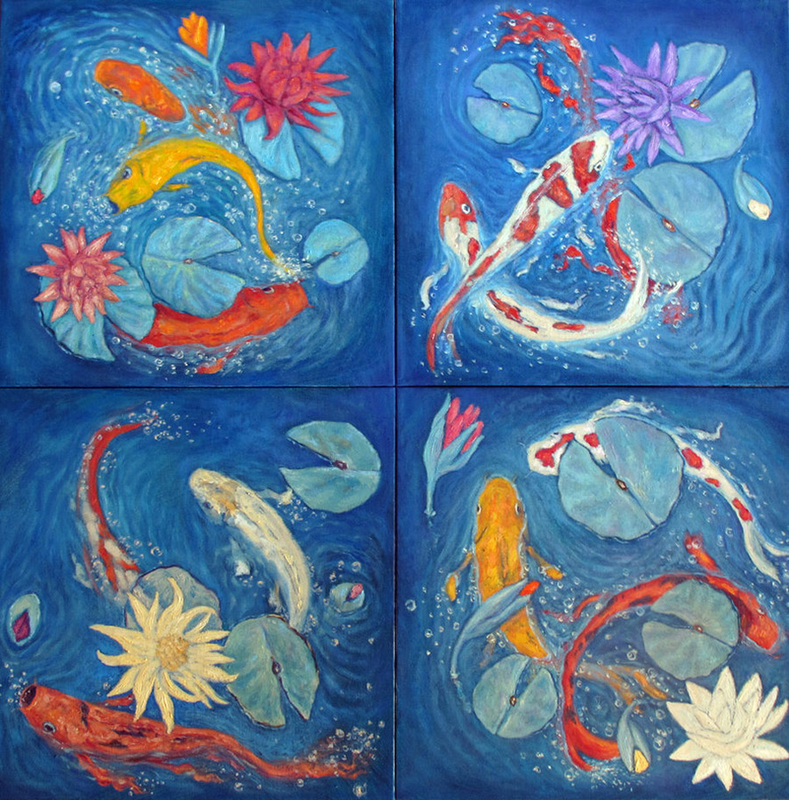 12 koi fishes represent 12 apostles of Jesus, which would represent the good and God, but around it are 5 developed lily flowers which stand for a 5 sided pagan star which would represent evil, as well as a total amount of flowers and lily pads are 13 each which is considered to be an unlucky number. The fishes also represent people and how they are around in society in this fast paced world some just floating through others are more active (Bubbles represent activity and how fast fishes are swimming) and relations between different individualities(not one fish is exactly the same as any other as well as the colors of developed lily flowers), the fishes also swim around each other as well as those pads that get in their way, kind of like obstacles in everyone’s life, and the journey seems long until you finally get to your end, however everything in this world is based on the rules like the geometric combinations of canvases, but we don’t know what is beyond, perhaps our soul may live on, in another dimension and world without these rules where our physical body dies and then a question whether our spiritual self or soul remains. I also put quite a few hidden messages in this piece… which I will not talk about, because it’s now up to the viewer, not the artist. PS.This can be a new style of creating art, interchangeable canvas paintings, from which this is my second prototype, the first was with three canvases and only interchanged horizontally, this one really has no restrictions, only the logical geometric ones which of course the person can break anytime they feel like it, for the canvases to go any way the person chooses to with their interior. I put my heart and soul into this piece, I hope you enjoy it.